One of the largest trees in the world with an average height of 30 m, a maximum height of more than 50 m, and an average trunk diameter of 3 m. Endemic to New Zealand, meaning it does not naturally occur anywhere else. Kauri once covered large areas of the northern part of the North Island of New Zealand with forests, but it can be grown throughout the country. Heavy logging has significantly reduced the number of kauri trees. Both the timber and kauri gum were much sought after. The remaining forests are now protected, but are threatened with extinction due to kauri dieback. This is caused by a pathogen that infects the roots and starves the tree to death. Agathis australis is a coniferous tree with thick, leathery leaves, 2-3 cm long on adult trees, and 5-10 cm long on juvenile ones. The leaves of young trees are often bronze-coloured. Male and female cones are borne on the same tree. The photo shows female cones which are rounder and shorter than the male ones. Ripe female cones release winged seeds that are dispersed by wind. Agathis australis grows best in rich, fertile, moist and well-draining soil, but tolerates a wide range of soils including swamps, stony soils,and heavy clay. Plant in a sheltered position in full sun or part shade and stake the plant for the first season or two. Tolerates moderate frosts (zones 8-10) once established. Not recommended for coastal areas. Kauri eventually becomes very large and thus needs plenty of room. However, it takes about 30 years to reach a height of 10 m, so it can be accommodated in a smaller garden for a long time. Graceful fast-growing evergreen or semi-evergreen tree from Mexico and Central America, with drooping branches and pale grey bark. Leaves resemble birch leaves and are 5-10 cm long, dark green, leathery, with toothed margins. Most leaves are retained during winter, but some leaf-shed occurs throughout the year . Looks beautiful in spring with a mixture of new light green leaves and mature dark green foliage. Minute flowers arranged in light-green, pendulous catkins to 7 cm long (male) or in short catkins (female) on same tree. Green cone-like fruit, 1.5 cm long, turning dark brown with age. Alnus jorullensis likes a position in full sun or partial shade and prefers moist soils of any type, but tolerates drier soils although growth will be slower and may be stunted. Copes with medium frosts to about -12oC. Root system can be invasive and it is best planted away from foundations and pipes. Train to a single leader and remove lower limbs to lift the crown. Suitable as a specimen or shade tree. Can also be pleached, used as a screen, hedge, or bank stabilisor. Useful tree to dry out wet areas. Upright tree with rough, grey bark and branches spreading outward in tiers, endemic to New Zealand, occurring naturally throughout the country along damp forest margins and stream sides. Thin, usually mottled, ovate to elliptic leaves with finely toothed margins, 3-6 cm x 2-3 cm. Clusters of small white, .5 cm wide flowers in spring, followed in autumn by pea-sized, round fruits in cup-like receptacles, green initially, turning black on maturity. Carpodetus serratus has a juvenile form with tangled, zigzag, interlacing branches, and smaller, rounded leaves. Juvenile and mature growth may exist on the same tree. The tree acts as a host for the puriri moth caterpillars. Putaputaweta is a Maori word meaning 'many wetas', referring to wetas making their homes in the holes left by larvae of the puriri moth. The name 'bucket of water' refers to the very sappy wood. Prefers a damp, sheltered position in sun or shade, and fertile soil. Prune to maintain a good shape and remove dead wood. Tolerates -10 deg Celsius once established. Suitable for wetland planting and ok for coastal areas. Carpodetus serratus can grow into an elegant, small tree that is completely covered with flowers in spring. Tall, evergreen tree, endemic to New Zealand, with a rounded canopy consisting of large clusters of long, narrow leaves. Common throughout New Zealand in open ground, around swamps and damp places, and along forest margins. The leaves are linear with an entire margin, and up to 1 m long by 6 cm wide. They turn brown with age and remain hanging on the tree for a long time before falling, forming a skirt beneath the young green leaves. Large panicles of small, 0.5 cm wide, creamy white, strongly scented flowers are produced on mature trees in summer, attracting bees. Birds like the blue-white berries that are formed subsequently. Cordyline australis grows to about 15 m high, with an unbranched trunk when young (and undamaged), and forming side-branches in the upper part later. The Maoris used the leaves of Cordyline australis for medicinal purposes, and the roots of young trees as a source of food. Early settlers hollowed out the trunks of large specimens to make chimneys, since the timber (unlike the foliage) is fire-resistant. They used to boil and eat young shoots as a substitute for cabbage, hence the common name. Prefers a position in full sun or partial shade. Likes moist soil, but can cope with considerable drought once established. Grows in just about any soil type, including clay soils as long as they are not too impermeable. Tolerates moderate frosts (to zone 8) and is hardy throughout New Zealand. Suitable for coastal and exposed sites. Caterpillars may cause some leaf damage. Stressed trees are susceptible to rust. In warm, humid areas root rot (Phytophtora) may become a problem, but can be avoided by growing other plants beneath the trees to keep their root-zones cool. Great choice for a stunning architectural statement. Imagine a group of cabbage trees with a simple, contrasting under-planting of Muehlenbeckia astonii. You may want to plant Cordyline australis at some distance from your lawn....the lawnmower doesn't like the tough old leaves! Useful as a primary coloniser and good for erosion control on steep banks and along streambanks. Large deciduous or semi-deciduous tree of uncertain hybrid parentage (involving Australian native Erythrina species), with a short trunk and a relatively open canopy of ascending branches with rose-like thorns. Named after William Sykes, a New Zealand botanist. Compound leaves with three, heart-shaped, mid green leaflets, 7-20 cm long, 7-12 cm wide. Bright scarlet flowers to about 6 cm long, in clusters at the tips of bare branches in late winter and early spring. Has become invasive in parts of Australia, where it is difficult to control since it grows easily from root segments. branches and clippings. Prefers a position in full sun and moist soil. Can adapt to dry areas. Withstands coastal conditions, but needs wind protection. Branches are quite brittle and easily snap off during windy days. Tolerates light frosts to about -7 deg C.
Magnificent specimen tree, in particular during winter and early spring when the canopy of bare branches is covered with masses of large, vibrant orange flower clusters. Evergreen shrub or small tree in the legume family, with bright green, soft, needle-like leaves. Flowering in early spring with blue and white or lilac and white, pea-like, bee-attracting, scented flowers (to 1.5 cm across) clustered at the ends of the branches. The flowers are followed by small, wrinkled seedpods that each contain a seed. Psoralea pinnata is native to South Africa where it occurs naturally along streams and wet places (i.e. winter-wet areas). It has established itself in other regions of the world such as Southern Australia and the north of New Zealand where it is regarded as a weed. Psoralea pinnata tolerates a wide range of growing conditions, including wind, drought, high rainfall, coastal conditions, and poor soils. Because it is a nitrogen-fixer, it changes the growing environment for the original native plant species that may no longer be able to compete as a result. Germination is stimulated by fire. The pant is relatively short-lived (about 10 years). Psoralea pinnata prefers a sunny position, except in areas with very high summer temperatures where a partially shaded site is better. Tolerates waterlogged soils, but also copes with occasional drought once estabished. Prune after flowering. Self-seeds quite easily. Tolerates light to moderate frosts (zones 9-11). Striking tree when in flower. You may need to give it some help in the form of pruning and training to develop a good shape as it does not appear to do so naturally and often has a somewhat straggly, unbalanced appearance. 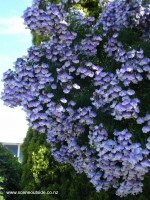 Fast growing, herbaceous, evergreen perennial, native to Brazil, Uruguay, and Argentina. Four-ribbed stems with somewhat sticky, lanceolate, toothed leaves. 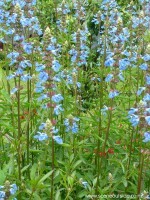 Azure blue with white, two-lipped flowers, 2 cm long, in whorls arranged in spikes, during summer and autumn. Prefers a sunny or partially shaded position in any type of soil. Really likes moist soils, but tolerates, and usually spreads less vigorously in, dry conditions. Generally disease-free. Cut back to near ground level after flowering. Spreads by means of underground runners. Keep an eye on these and remove them where they are not wanted. Tolerates moderate frosts. Frost-hardy throughout New Zealand. Reaches a height of about 1.8 m in one growing season, so plant in the back of borders for a gorgeous, long-lasting display of blue. Attracts butterflies. Evergreen rhizomatous perennial, endemic to South Africa, flowering during spring with golden yellow flower spikes up to 2 m tall. Sword-shaped, pleated, mid-green leaves 0.2-1 m long and up to 7 cm wide. Bright red roots. Prefers a sunny position and plenty of moisture. Ideally suited to swamps and wetlands, but adapts well to average garden conditions. During dry summers the leaves may die down unless watered regularly. Generally pest and disease free. Suitable for coastal gardens. Light frosts only (USDA zone 10), but in a sheltered spot the plant can survive an occasional moderate frost. Wachendorfia thyrsiflora is the perfect choice for a watergarden or the edge of a pond, but also looks magnificent as a backdrop for herbaceous or mixed borders.